Why should you use the Modulux ? Picard has gone to great lengths to unearth the highest quality baking stone, so you can have outstanding results. The steam system used in the Modulux oven creates a concentrated abundant steam. While employed, the steam seals the oven doors closed. This creates pressure on the bread resulting in a beautiful high quality tender bread with a golden crust. 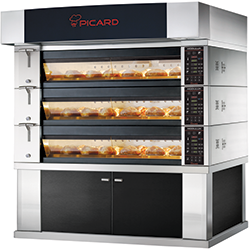 A Picard Ovens approved technician will take care of the unloading and installation at the customer’s site. All oven parts can pass through a regular standard door and can be moved by hand. All electrical, water and chimney hook-ups, are at the customer’s expense and have to be performed by a qualified installation technician and according to local codes.